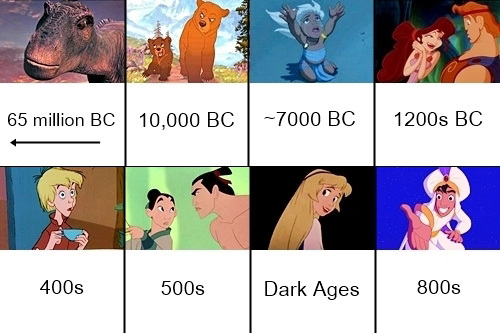 Where does Disney’s Brave fit into this timeline? Or did I miss it…..
Brave is part of the Pixar theory. This is just Disney. Even though Brave is part of the Pixar theory, Marida is still a Disney Princess. Remember that some of the theories are just that, theories. All made by us, the viewers, and some confirmed or declined by the people who work on these movies. I’m working on fusing them. I also made a Nintendo Universe Theory. “Robin Hood”, “The Wind in the Willows”, “Chicken Little” and “Zootopia” take all place in a parallel timeline placed somewhere in the Disney Cinematic Universe. where is beauty and the beast?? Did you even watch the ending? How can you miss that? Lol. Brother Bear 10,000 B.C. ??? how??? and why??? Well, you see, in Brother Bear, mammoths or mastodons (they never really specified) appear. What does this mean? Well, mammoths went extinct after 10,000 BC. Thus, Brother Bear has to take place back then, or else mammoths wouldn’t be able to appear. Ok, how is Lion King set in 1994 but Scar appears in Hercules? Well, to tell the truth, Lion King could occur at any point in history, really – there are no human characters to give it context. Unless you take the ‘Timon and Pumbaa’ TV series as canon, that is. They put 1994 because that was the release year, it could happen at any point really as its a timeless movie. Hercules must be 600-400 BC, no? Rome took over and was functioning well in the transition from BC to AD. So Hercules must be 600-400 BC, as attica said. Not really. Why “must be”, is there a particular reason? Anyway, for the Greeks, one of the Ages of Man, the Heroic Age, that is, the period all the demigods fought monsters and each others and so on, took place before them (hence why many cities boasted having been founded by such and such heroes) and ended a little after the Trojan war, starting the Iron Age, the present-day for the Greeks of the time. This was mainly popularized by the writer Hesiod, and in turn, later, Saint Jerome established a real-time chronology of Hesiod’s Ages, giving the Heroic Age as having lasted from 1460 to 1103 BC. To be more precise, he gave one of Heracles’ teachers as having taught him in 1264 BC. Hence this date probably derives that. King Lion must be before Hercules because there’s no sign of human life AND there’s a cameo of Scar in Hercules. I don’t think that there are signs of human life in The Lion King because tourists, villiagers, any humans in general stay FAR AWAY from the animals in Africa. Plus, Hercules took place in ancient Greece, how does one get from Greece to Kenya (I think The Lion King takes place in Kenya but I don’t know.) They didn’t have planes or cars back then. Lion King took place in Tanzania. You can’t make any assumptions on the time period based on the lack of people in it. There is no evidence pointing in any direction. But what there is is Scar in Hercules. Lion King had to have taken place at the same time as Hercules’s training in order for Hercules to receive Scar’s pelt in good condition. The Greeks did travel Africa. Did they make it all the way to modern day Tanzania? I have no clue. But that is the most we can go on. The Hercules connection could be explained as Scar being the descendant of the Nemean Lion. Scar himself could not have been the Nemean Lion because in the myth of Hercules, the creature had unbreakable skin and Hercules was forced to choke it out. We only see Hercule engage the Nemean Lion before he kills it offscreen and wears its fur(which he did in the myth because the skin was still unbreakable). If Scar was the Nemean Lion he would not be killed by the Hyenas. The Timon and Pumbaa series does indeed set the events of the movie in present day due to the presence of humans and technology or that era, however there is another factor that places the Lion King in this time period. Timon and Pumbaa are heard singing the song “The Lion Sleeps Tonight” by Solomon Linda, a song that did not exist until 1961, and while references made by characters who are magic make sense since Merlin can perceive events from the future as can presumably the genie from Aladdin, and references made by other characters can be purely coincidental “Maoi: When you use a bird to write it’s called tweeting”. In this situation Timon is clearly singing the exact song. there’s a theory about Aladdin taking place in a post-apocalyptic future and i agree that the lion king should be before hercules because not only about Scar’s appearance but hence, “the circle of life”. Aladdin is from 1001 Arabian Nights which, for the most part, are stories from around the 800’s. There is no exact date you can attribute, but 800’s is a good guess. But in the many games that came after Aladdin shows evidence of twentieth century Objects as well as the comments made by Genie when he was release from the lamp as in Quote: “Oi! Ten thousand years will give you such a crick in the neck.” Also he does impersonations of many other characters from other Disney movies, for example: Pocahontas, Arnold Schwarzenegger, and many others. @Yumasaka The genie is probably about to travel through time so he mixes up stuff from the future, past, and present. Actually, Hercules takes place AFTER Aladdin because there is a TV series for Hercules and the show takes place during the years of Herc’s training on Phil’s island. One episode was a crossover with Aladdin. When Phil talks to Jasmine, she says that she’s married to Aladdin so Aladdin probably went first in the timeline before Hercules. I would like to point out if you watch the aladdin and hurcules tv series they have a crossover episode or does everyone seem to forget that. The Timon and Pumbaa series does indeed set the events of the movie in present day due to the presence of humans and technology of that era, however there is another factor that places the Lion King in this time period. In the Lion King,Timon and Pumbaa are heard singing the song “The Lion Sleeps Tonight” by Solomon Linda, a song that did not exist until 1961, and while references made by characters who are magic make sense since Merlin can perceive events from the future as can presumably the genie from Aladdin, and references made by other characters can be purely coincidental “Maoi: When you use a bird to write it’s called tweeting”. In this situation Timon is clearly singing the exact song. Why is the hunchback of Norte dame at 1482 and not at the 400’s? Because the book begins on January 6, 1482 on the day Quasimodo is crowned the King (or Pope in the original book) of Fools. The timeline being used will, when possible, source the original dates for the stories the movies are based on. Why should it be the 400s? In the 400s, not only was the Notre-Dame Cathedral not built, France was not yet a kingdom (or even called “France” for that matter), and the Roman Empire was still around (albeit split in half and the western part on his last breaths). Is there a reason why you said 400s, or was it just a number you wrote at random? I think Chicken Little should be in the future when animals take over the world. Frozen is wrong. Frozen is supposedly set 2 years after Tangled in the Disney Theory which means it was set in 1822. Isn’t frozen set 3 years AFTER tangled? If Tangled took place in the 1820 shouldn’t there be guns or more advanced ways of protecting a castle. They mention Mozart, which puts it past 1791 at the very least. No need to show gunpowder everywhere. what about the second peter pan? Because it’s a direct-to-video sequel and not one of Disney animated movies canon. However, Fantasia and Fantasia 2000 are missed in this timeline. -Toccata and Fugue in D Minor, the sequence with abstract forms is dated in 1940 because it’s just visual representation of music played by the orchestra. -Nutcracker Suit is allowed into end of 19th Century because flowers dancing are dressed like Cossacks prefiguring Russian revolution. -Dance of the Hours is more difficult to dated. The animals are typically dressed like in 19th century Ballets. However, there is also a possibility that the characters made only a theatrical representation in 1940. -Night on Bald Mountain/Ave Maria is situed also before The Sword in the Stone. -Symphony No.5 in C. minor is situed in 1941. -Pines of Rome is in a similar case to The Lion King. Plausibly in 1999. -Rhapsody in Blue is derouled in 30’s. -Piano Concerto No.2 in F major is scheduled into 19th Century. It’s an adaptation to The Steadfast Tin Soldier. -The Carnival of the Animals is dated in 1999 because it’s centres on a flamingoe playing with yo-yo. -Pomp and Circumstance is a adaption to Noah’s Ark. Also placed between Atlantis and Hercules. -Firebird Suite is scheduled in 1999 or 1919 (like the music). There are not humans or objects présent in this segment fort to determinate it’s exact date period. The fantasia films, along with the package films from saludos amigos to melody time, don’t qualify for this list as they are segmented and don’t have set timescales. Correction: According to the video, Aladdin took place BEFORE Hercules. Shouldn’t The Little Mermaid and Cinderella be within 1-5 years of each other since the King and the Duke from Cinderella appear at Eric and Vanessa’s wedding? Just a thought. And if the dogs similar to Lady and Tramp in the One Hundred were their own descendance ? Surely Beauty and the Beast and Hunchback happened in a similar time period. You can see Belle walking through Paris in the Hunckback of Notre Damme. She’s also dreeses in her blue dress she wears at the beginning of the film suggesting that Hunchback happened first. You notices that Gaston and LeFou’s clothes are similar to 18th Century. Gaston had also a pistol. Beauty and the Beast is not a medieval story. Where’s Frozen and Brave in all this? Frozen is places after Tangled. 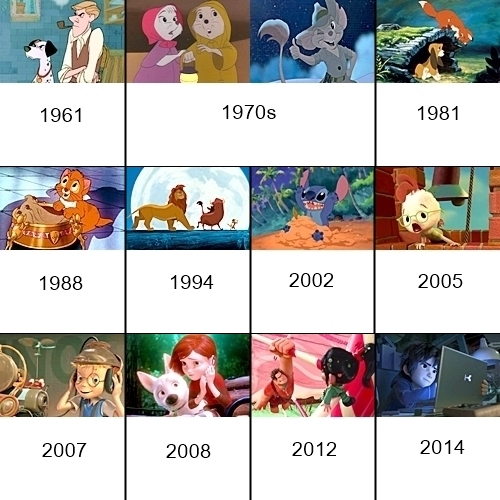 For Brave, see Pixar timeline who is a différent theory. I don’t know if this has been said already, but I noticed they placed The Lion King in 1994, now that is all and good, but in Hercules there is a Scar Lion skin. How can Hercules come before Lion King if Scar is alive in the Lion King. Just do Scar’s skin being in Hercules I would argue that Lion King happens only slightly before Hercules. Since there are no threat of people in Lion King, that would have to mean that Lion King is set in a time where people are very sparse. And furthermore, Lion King doesn’t have to be set in Greece, trading of exotic goods was very popular. Leaving The Lion King in Africa and Hercules in Greece. In other posts on this website you say that Aladdin has to take place after the year 30000 (Due to many cultural references made by genie. ), thus being second to last in the timeline and not number eight. This also should effect Hercules, which would effect pretty much everything else in the timeline seeing as Hercules is Ancient Greece. This makes the entire timeline fall apart, or Ancient Greece is actually in the future. So maybe it is not the Disney timeline that is messed up, but it may in fact be our own earthly timeline that is wrong. Doesn’t Big Hero 6 take place in 2332? Shouldn’t it come just before Treasure Planet? 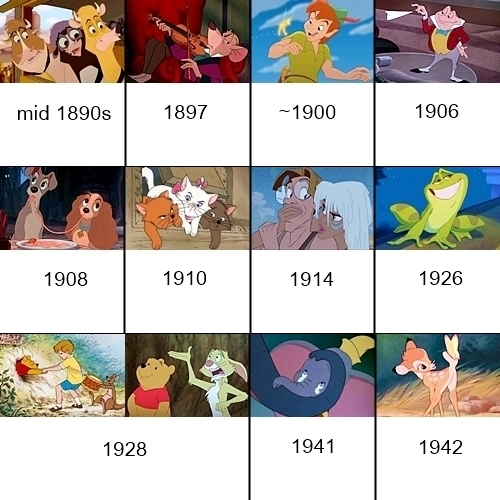 Fox and the hound takes place in the early 1910-1920’s. Look at the style of clothing, the vehicles, and then relate to fox and the hound 2 even more timeline references, with the vehicles, clothing, the diner, etc. Based on another article, Aladdin is based on a post-apocalyptic setting. Is so, why is it in 800??? But… Ariel meets her author in her prequel cartoon series, which influences him to write the original fairytale, making Ariel’s movie take place in the mid 1830’s. Tarzan also meets his author in his sequel cartoon series. What movies are the last two? I can’t seem to be able to identify them… Thanks. Wouldn’t Beauty and the Beast take place either at the same time as The Hunchback of Notre Dame (Belle makes a cameo) or right before the French Revolution? Atlantis: the lost empire actually takes place in the 1940s. In the beginning of the movie it shows the year, and it’s 1941. I have made a Disney Theory of my own using over 50 Disney full length animated features connecting them all onto the same timeline and showing the Disney Universe in its entirety. Please email me if you want to know more. I do enjoy your theory but I would like for you to possibly explore mine. Thanks. I would be SO interested in hearing your theories Mya! My friend told me that she became unsealed when she saw a few characters make cameos in other films and now I’m hooked! Hahaha! I think The Lion King happened sometime before Hercules due to Scar appearing in the film. Plus there is no sign of human life at all in The Lion King, unless it is deep in the savannah far away from tourists and civilians. But even so, either Mufasa/Simba/Scar/Hyenas would had frightened humans away from their homes. Also, Big Hero 6 must of happened way into the future. Although there are now prototypes of the microbots around at this present time, thousands or even millions wouldn’t had been made in the year of 2014 that quickly without a lot of media attention. The buildings also look too futuristic to be in 2014. Although Hiro is a very smart and intelligent young inventor, an child of 14 years of age in the year of 2014 would not had the brains and technology to design microbots, battle gear, rockets and even a version of Baymax. I happen to think that Aladdin must of happened years after Big Hero 6. The genie has been locked in the lamp for 10 thousand years, mentioned Aladdin’s gear is too third century and can also use too many modern references I,e, game shows, cars, neon lights etc. But I think that this could lead with the Pixar theory with the events after Wall-e, bugs life and before monsters inc as there is too much sand in Aladdin and hardly any building besides Argabah. How did EVERYONE neglect the best Disney movie of all time, The Black Cauldron?! What do you mean? It’s in there. How did EVERYONE neglect the existence of the best Disney movie EVER, The Black Cauldron?! The producers of Frozen started a whole lot of buzz when a fan asked them on Reddit if the Little Mermaid/Frozen/Tangled theory was true. Their response? That the Arrendelle king and queen didn’t die in the wreck, but actually escaped to an island, had a son, and were killed by a leopard. That means that Elsa and Anna’s parents survived the wreck, lived in the jungle, and had another son (TARZAN!) who was later raised by gorillas. The classic book Tarzan states that his parents are/were rich Brits, not Norwegian royalty. Now add Inside Out and The Nightmare Before Christmas to the timeline. You will have to edit this whenever a new Disney movie comes out. Right now you have to add BRAVE, it takes place in medieval Scotland. It’s considered like a Pixar movie and not an Disney movie. I suggest it because Disney is plausibly an multiverse…Many timeline exists ! what are the last three films in that timeline? WALL-E, Monsters University, then Monsters Inc.
No. It’s Big Hero 6, Meet the Robinsons and Treasure Planet. This timeline don’t consider Pixar movies. Tales From the Arabian Nights was written in the 19th century CE, and Hercules takes place before 1 BCE. Tarzan’s parents are British, not Norwegian. Sleeping Beauty, Snow White and the Seven Dwarfs, and Cinderella all likely take place either in 1812 or earlier. Now where do you put Zootopia​? Somewhat unrelated, but I wrote an exhaustive timeline of every Disney couple ever, in historical order from 500 B.C.E to 2805 C.E. One thing that is inaccurate is the dating of Frozen. In the short Frozen Fever, a map of the Southern Isles briefly appears, with the Roman numerals “MDCCCXL” or “1840” written in the upper left corner. 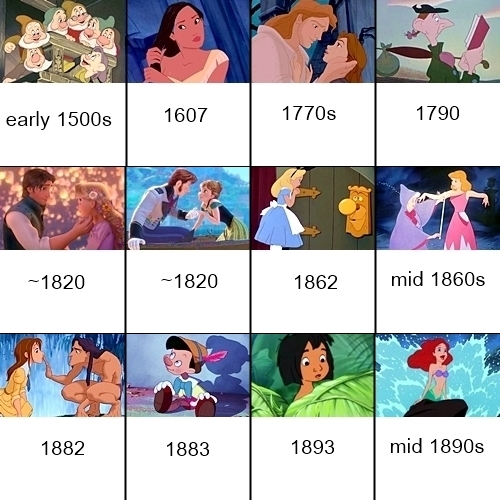 That presumably makes 1840 year when the short takes place and by association, Frozen happened in 1839 one year earlier. The Winnie the Pooh movies don’t take place in 1928. They take place in the late 80’s and early 90’s. My introduction to Winnie the Pooh was the TV series that ran through the 80’s and 90’s, titled, “The New Adventures of Winnie the Pooh.” It’s what most people who grew up in the 90’s mean when they say “the good old Pooh cartoon.” This series is blatantly set in at least the early 90’s, in America, judging by the places they go to in certain episodes. The continuity gets a little shaky with this cartoon, as the original Winnie the Pooh movies that came before it have Christopher Robin speak with a British accent. In the cartoon, Christopher Robin speaks with an American accent. After the show ended, future Pooh movies and shows made him British again. I think this has to do with the Disney company trying to rewrite the continuity (similar to how the TV series of 101 Dalmatians switched the setting to America), and then changing the continuity back to how it originally was later. The discrepancy is not important. Since the early Pooh movies didn’t have a specific setting, one could conclude that the setting is America, and that Christopher Robin is American and was just voiced by a British actor in the original movies. There’s a continuity error in Piglet’s Big Movie where Tigger is shown during the flashback where Kanga and Roo move into the Hundred Acre Wood. In the original Pooh movie, it is established that Kanga and Roo already live in the Humdred Acre Wood when Tigger first arrives. But this is a continuity error, not an attempt to rewrite the continuity. Pooh’s Heffalump Movie, as well as the show “My Friends Tigger and Pooh,” blatantly ignored the cartoon I grew up with and loved so much. In these, the gang claims they never saw a Heffalump before, and they find out that not all Heffalumps are bad. It’s a cute movie, but anyone who grew up with the good old cartoon from the 90’s knows that the gang HAS seen Heffalumps before, both good and bad ones, along with woozles. So the Disney company can’t even keep the continuity right for an official franchise. Despite what they probably intended (for the events of the cartoon to not have happened, and the events of Pooh’s Heffalump Movie to be the real events), I pretend Pooh’s Heffalump Movie (and My Friends Tigger and Pooh) never happened (the rest of the movies did, because they’re great movies), that the good old cartoon DID happen, and that Winnie the Pooh is set in America in the early 90’s. Anybody else want to chime in with their opinion? I think it takes place more into the future –but before treasure planet. The 1973’s “Robin Hood” and “Zootopia” are together in a separated part of the Disney Cinematic Universe where the humans beings have never existed. “Zootopia” is placed in the future of “Robin Hood”. There are a few missing here first of all. Secondly, you’re off on a few. It’s now been confirmed that Frozen and by extension, Tangled take place in the mid-late 1830s, almost 20 years after your timeline says. Mulan was from the 200s AD (confirmed by special features on the special edition) and The Emperor’s New Groove would have to have taken place before the 1500s because it takes place before Europeans discovered South America, not right around the same time. Also, Peter Pan was in the 1920s we definitely see the wealth that was common in that decade and the sequel which presumably takes place 20-25 years later based on Wendy’s age in the original movie and the ages of her children in Return to Neverland, takes place during WWII. If “Snow White” takes place early 1500s, it would have to be placed before “Kuzco” in the picture. With a precise year.